Welcome to The Isle… Lily Locke has never believed in witches and wizards, ghosts and magic, shifters and vampires—especially cute blonde vamps with blood-intolerance issues. A rising star at a hotshot marketing agency in Minneapolis, Minnesota, all Lily knows is that she’s a PowerPoint guru, an Excel ninja, and a coffee-maker extraordinaire. Not to mention she’s next in line for a huge promotion. All that changes when Lily’s assistant delivers a strange quiz to her, one titled A Magical Assessment for Normal Folks. With it comes the promise of a land she’s never known existed. A land where Lily not only discovers her biological family for the first time, but a place where she can make a difference, change lives, and step into the role she’s destined to fulfill. But first, Lily must admit she’s a witch. Then, she has to acknowledge that the tall, dark, and mysterious man who offers his help is strictly focused on business…at least, for now. When a body turns up dead and the next target is Lily, she must trust her powers and accept the help of her newfound friends. Otherwise, she’ll never survive the trials of the magical island tucked far, far away in the frigid waters of Lake Superior. Welcome to The Isle. I really like the premise of this book, but the characters and the situations really seem more written for YA than an adult crowd. The characters weren’t very well developed and seemed much more like stock teenagers than adults. None of the characters ever demonstrated any interests. What irks me most is that this book is considered a mystery. Sure, there are mystery elements, but there is no big mystery here; nothing is solved. If this was under Romance and Mystery it might be excused, but this is under Mystery and a mixture of various supernatural creatures– not all of the creatures it is listed as a mystery of actually make an appearance in the novel! 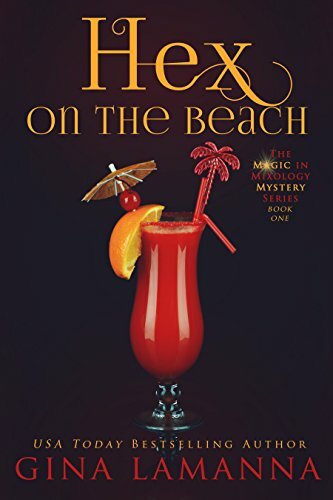 Gina LaManna is the USA TODAY bestselling author of the Magic & Mixology series, the Lacey Luzzi Mafia Mysteries, The Little Things romantic suspense series, and the Misty Newman books. Stop on by and say hello on Facebook!